Having said this, there are other tools available through which knowledge and information can be transferred to students. One of the alternatives available is Kahoot. Now, many of us might have heard of or used this tool in our classrooms. Kahoot is a game-based teaching tool that teachers usually use to test student knowledge after their teaching is completed. However, Kahoot can be used for purposes other than testing. This post introduces Kahoot as a tool that can replace PowerPoint presentations for teaching purposes. In the past 4 years, I have been using Kahoot for teaching grammar lessons, reading comprehension, and developing APA skills in my college classrooms. The way that Kahoot can be used is interestingly flexible. You can play a whole game at once to increase student participation, learning, excitement, and/or improve classroom dynamics. But, a more effective approach towards its use would be to utilize Kahoot for student knowledge construction. The educator can design the Kahoot game on the most important concepts of the lesson, which are traditionally taught in post-secondary institutions through a PowerPoint lesson. Having a Kahoot game designed effectively on the main concepts of the lessons can help students listen attentively and engage in the learning process since they are involved in a game and want to know how to score better on the next question. 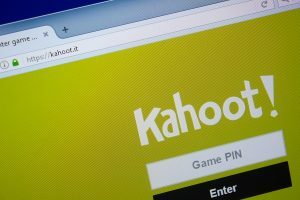 Unfortunately, when describing Kahoot in various articles, the teacher is usually referred to as a gameshow host, which is true to some extent. Nevertheless, there are other roles that the teacher can play, which would facilitate the learning process and assist students in the knowledge construction process. This could easily be done by pausing the game and asking students for reasons that they chose an answer, right or wrong, and providing additional information, or even pulling up information from another resource to make sure students are comfortable with that question before moving on. and enhance student critical thinking. In conclusion, using Kahoot to replace traditional PowerPoint can be a new effective way of engaging students in an active learning practice. So, the next time you are creating a PowerPoint slide, consider transferring its main points into a Kahoot game. Try using the Kahoot game as your visual and teaching tool. Leave a comment below to let us know how it went – or to share your ideas of using Kahoot in the classroom.